Experience really does make a difference in most professions. When it comes to elderly individuals or disabled adults who might need some assistance throughout the day, nothing is better than an experienced home care aide or other provider at keeping them safe and also helping them eat better. March is National Nutrition Month and for somebody in their 60s, 70s, 80s, or 90s, diet may not be the first thing on their mind. They may not think much about the kinds of foods they eat. After all, they made it to this point in their life in much the same way they had throughout most of their adult years, so what difference would it make if they continue to that have it now? A home care aide with experience will understand a client’s diet. Every client is going to be different and while one may have to avoid certain saturated fats or red meat or something else, another client may have to be focused on the types of drinks they consume throughout the day. 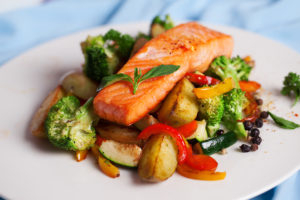 Because that aide, who has worked with many seniors through the years, has had direct experience with these variety of diets and they can share insight and information about why it’s so important for their particular client to avoid or focus on certain foods and beverages. An elderly loved one may not listen to family members. When an elderly has been advised by his or her doctor to change their diet, focus on different types of foods, and avoid certain things, their adult children may be the ones helping support them. They may be much less inclined to want to listen to these children, whom they may still see in their own mind as their children, because of that relationship. If, on the other hand, the elder is receiving information or advice, even encouragement, from an experienced home care aide, they may view that advice differently. They may be more inclined to listen to what they have to say, especially if they can point out specific examples from other clients with whom they worked over the years. It’s important to be patient. Family members may be concerned about their elderly loved one’s health and that can cause some impatience. In truth, patience is one of the most important aspects of a working relationship. If the family gets impatient, it can harm the relationship, making it that much more difficult to convince the elder to follow certain bits of advice. If you or an aging loved one are considering Elderly Care Services in Fort Lauderdale FL to provide companionship, compassion and motivation, please contact the caring staff at Responsive Home Care. Call today 954-486-6440.